Green tea has antioxidant, anticancer and immunity-boosting effects, says the University of Maryland Medical Center. The phyotchemicals in green tea help to “shut down glycolysis,” which is the cancer cell’s main energy supplier, explains the A.P. John Institute for Cancer Research. This effectively starves the lymphoma cancer cells until they die. For treating lymphoma, the University of Maryland recommends taking 250 to 500mg daily of green tea standardized extract. 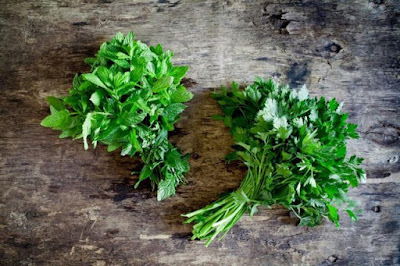 Parsley has been used in traditional medicine to treat tumors, and the tea was used to treat cancers, notes the Herb Growing & Marketing Network. The roots, leaves and seeds are all used in medicinal preparations, which include teas and extracts. Parsley can stop the growth and spread of lymphoma cancer cells, says the A.P. John Institute for Cancer Research. Parsley contains compounds that “help shut down certain enzymes called Epithelial Growth Factors, which stimulate the growth and spread of cancer,” the Institute explains. In some countries, licorice root is used to treat cancers, according to the Herb Growing & Marketing Network. Licorice root extract produces steroid-like effects in the body, helping lymphoma patients to gain weight, says the A.P. John Institute for Cancer Research. Licorice also helps to “inhibit the growth of lymphomas and leukemias,” the Institute notes. Reishi mushrooms have anticancer and immune system-supporting effects. The University of Maryland Medical Center advises taking 150 to 300mg two to three times daily of the standardized reishi mushroom extract or 30 to 60 drops two to three times daily of the tincture. Milk thistle is helpful in detoxification support. Milk thistle’s chemical properties act in the body to protect cells from toxins and increase glutathione, a substance needed for detoxification reactions in liver cells, says the Herb Growing & Marketing Network. The University of Maryland Medical Center recommends taking 80 to 160mg two or three times daily of the milk thistle seed extract.